Exterior AccessoriesThere are 35 products. Multi-layer breathable full car cover suitable for both indoor and outdoor use. Lotus genuine replacement Naca duct. Fuel filler cap for later model cars. Key and barrel not included. Black anodised aluminium extended 5-element rear diffuser. Fitment: Elise/Exige S2 - all variants. Available To Order Now! Pair of grilles for use with Hangar 111 Signature Twin Exit Exhaust. 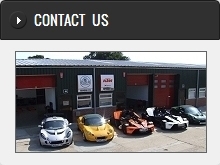 Fitment: Elise 111r, Exige S2, Exige S, Elise S with Signature Type 3.4 and 3.5. Heavy Duty High specification stainless-steel front towing eye assembly in 3.5mm thick stainless steel. Powder-coated in black with red towing eye. Direct replacement for all front towing eye mounts. Pair of Foam-filled Carbon Fibre side sills for the Elise S2/111R and all Exige S2 & S variants. Bolts to underside of sill panel. Mira tested. Extended length 3-element rear diffuser. Fitment: Elise 111R, Elise S, Exige S2/S. Tough stove-baked black finish that will not fade. Direct replacement strong, lightweight service panel set in pre-preg carbon fibre. Fitments for Exige S2 and Exige S models only. Carbon fibre undertray in standard-width desgined to replace the original undertray. Lighter, stiffer and comes complete with 3 NACA ducts for engine bay cooling.